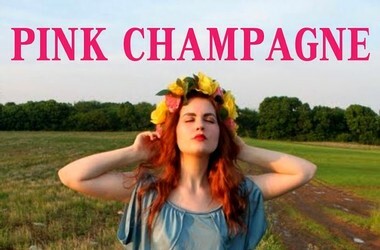 pink Champagne. A tad retro wouldn't you say? But I guess that is their color n’est-pas? In France we call them rosés. 1. Rosé de Saignée: In a rosé de saignée (such as a Billiot) the juice is allowed to sit for a longer period with the red grape skins, picking up some of the red pigment. The subsequent wine* will have this light red color. 2. Blending: Many rosé Champagnes are made by blending in a red still wine with white Champagne (à la Dumangin). In other words, the producers ferment some red grapes separately to make a red wine and this is later blended in with the white Champagne. Champagne snobs believe saignée to be the best method, but, as Americans say, I let the Champagnes speak for themselves. Now go and impress your friends**. But first let’s enjoy a flute, or three, or four of some of my rosé darlings. *Oui, Champagnes are wines - just wine that has been fermented twice. **See rosé food pairings to show them the true gourmand you are! In Defeat We Need It." Le Sabrage (a.k.a. sabering a bottle of champagne) became popular after the French Revolution when the saber was the weapon of choice of Napoleon's fearsome light cavalry (the Hussars). Be bold. If you've purchased a pricey Champagne saber, whip it out. Otherwise, a solid butcher's knife will do just fine. Have some glasses (and maybe a couple of towels) handy. Be sure to start with a bottle of Champagne that is very cold (38-40°F, tops). Remove the foil wrapper and little wire cage. This will make for a clean break, although some people say it's not necessary to remove the packaging. Grasp the bottle properly. That would be firmly, by the base, and pointed away from any onlookers. Hold it at a 30-degree to 45-degree angle. Find one of the two vertical seams running up the side of the bottle to the lip. That intersection with the lip is where the bottle will break most cleanly, and that's where you want to aim your stroke. Hold the knife flat against the bottle, blunt edge toward the top with the sharp edge facing you. Run your saber or knife slowly back along the seam toward your body. Then, quickly and firmly thrust it back up the seam toward the bottle's tip. Strike the lip sharply, making sure the leading edge stays down and in toward the crook of the lip. Apply a solid follow-through. If you've performed the task properly, the cork (with a ring of glass around it) will fly off the end of the bottle. You'll then begin pouring the bubbly, and humbly say "a little trick I learned from Henri" and offer a very clever toast. Beware mon ami ~ like the Napoleonic Wars, this is not without its hazards. May I reccomend a few successful efforts before trying on horseback? 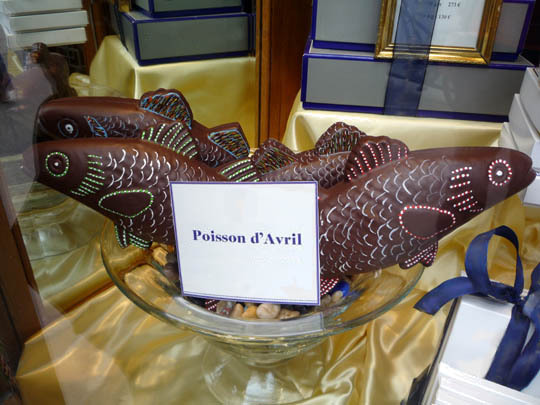 As I write, I sit with a beautiful friend toasting Spring with a Margaine Demi-Sec and savoring delicious little chocolate fish. I chose a demi-sec to complement the sweetness of the chocolate, but any of my boutique Champagnes would be exquiste with chocolate - explore my Reserve). Later, we will choose to be naughty in other ways. I will be serving it with Diebolt-Vallois Prestige Blanc de Blancs (in honor of Paris' fashion week - the house Champagne at the George V).